TRAFFIC ON THE M50 northbound is at a standstill following a breakdown and a crash at different junctions. There are extremely long delays from junction 16 Cherrywood all the way through to Junction 7. One car had broken down at Junction 13 earlier in the day while a crash further up the motorway compounded the traffic. That crash has now been cleared but there are still significant delays. 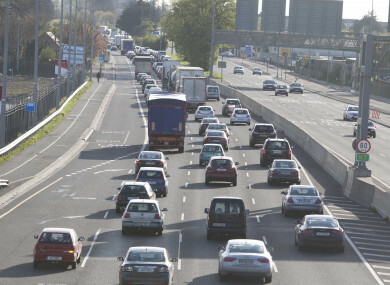 Motorists have reported taking two hours to go from Junction 16 to Junction 10 Ballymount. Email “Traffic on M50 northbound at a standstill following crash and earlier breakdown”. Feedback on “Traffic on M50 northbound at a standstill following crash and earlier breakdown”.